A proud nation is celebrating its 49th Independence and National Day today, commemorating the declaration of Bangladesh’s independence from the clutches of Pakistan. The day is being observed amid a growing demand for protection of the glorious history of the country’s War of Independence. In the early hours of March 26, 1971, Bangabandhu Sheikh Mujibur Rahman proclaimed the independence following the heinous attack on unarmed Bengalis by Pakistan forces on the midnight of March 25. The war broke out on March 26 in 1971 when Pakistan military launched operations against Bengali civilians, students, intelligentsia and armed personnel. Defecting Bengali military and paramilitary troops as well as civilians by forming ‘Mukti Bahini’ started guerrilla warfare against the Pakistan occupation forces. Jamaat-e-Islami opposed independence of Bangladesh -- then East Pakistan -- and formed militias such as Razakars, Al-Badr and Al-Shams which massacred Bengali civilians, particularly religious minority people. Bangladesh gained independence after a nine-month bloody war against Pakistan through supreme sacrifices of three million people. Two million women also lost their chastity during the war. With the declaration of independence on this day in 1971, people took up arms to free the country from the clutches of Pakistan and eventually liberated the soil of the land on December 16. A thirty-one gun salute at dawn will herald the day. President Abdul Hamid and Prime Minister Sheikh Hasina will lead the nation in paying tribute to the martyrs by placing wreaths at National Memorial at Savar at 5:57am. The national flag will be hoisted atop the government, semi-government and private buildings on the occasion. President Abdul Hamid, Prime Minister Sheikh Hasina and Leader of the Opposition in separate messages HM Ershad greeted the nation on the occasion. In his message, Abdul Hamid extended his heartfelt greetings and warm felicitations to the countrymen. Abdul Hamid also recalled the four national leaders, valiant freedom-fighters, organisers, supporters, foreign friends and people from all walks of life who made great contributions for attaining the people’s rights to self-determination and the war of liberation. He said that the contributions of all would be written in golden letters in the history of our independence forever. “We’ve achieved our hard-earned independence through huge sacrifices. Bangabandhu always cherished a dream of building a happy and prosperous country along with achieving political emancipation,” he added. In her message, Prime Minister Sheikh Hasina conveyed heartiest greetings to the countrymen as well as all expatriate Bangalees. “March 26 is the day of earning self-identity of our nation. It’s the day of breaking the shackles of subjugation. On the eve of the Independence Day, I recall with deep gratitude the greatest Bangalee of all times, Father of the Nation Bangabandhu Sheikh Mujibur Rahman, under whose undisputed leadership we earned our independence,” she said. The premier paid deep homage to the three million martyrs and 200,000 women who lost their honour in the war of liberation. “I also pay my tribute to the four national leaders who steered the liberation war in the absence of Bangabandhu. My homage goes to the valiant freedom fighters, including the wounded. I extend my sympathies to those who had lost their near and dear ones and were subjected to brutal torture during the war,” she said. Newspapers will bring out special supplements today on the occasion of the day. Bangladesh Television (BTV) and Bangladesh Betar and private radio and TV channels will air special programmes on Independence Day. Different political, social and cultural organisations have also chalked up elaborate programmes to mark the day. Public buildings and places will be illuminated and decorated with buntings and festoons. Improved food will be served in hospitals, jails, orphanages, vagrant homes, Muktijoddha Kendra and charity homes. The government has tightened security across the country to foil any subversive activities. The ruling Awami League has also outlined a two-day programme to mark the day. The AL will hoist the national and the party flags atop Bangabandhu Bhaban and all the party offices across the country. Sheikh Hasina, also president of the AL, will place wreaths at the portrait of Bangabandhu at Dhanmondi at 7:00am. AL leaders will also place wreaths at the grave of the country’s founding president Sheikh Mujibur Rahman at Tungipara in Gopalganj. 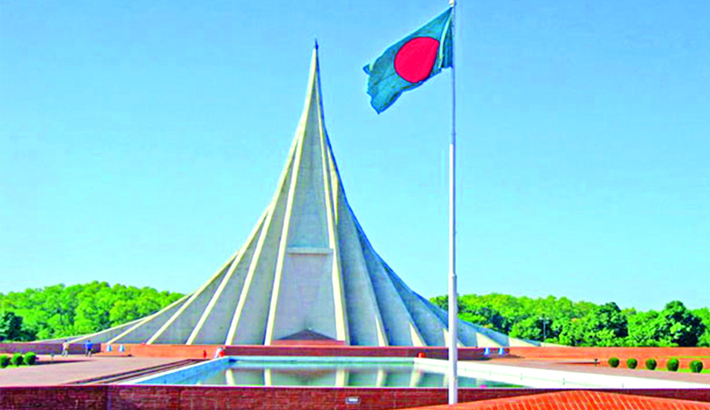 The ruling party will hold a discussion tomorrow at Bangabandhu International Conference Centre in the capital. The premier is expected to preside over the programme.